If a good game scratches a player’s itch, then surely it is the mark of a great game when it scratches an itch a player didn’t know they possessed. 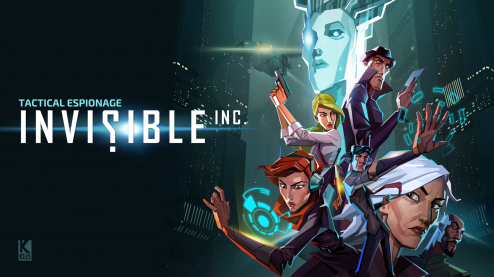 Klei Entertainment’s Invisible Inc is of the rare breed of game that excels in doing the latter. It combines the best parts of Shadowrun, X-Com/XCOM, and Monaco into a tactical, turn-based, game of espionage and corporate raiding. Behold, the game I never knew I always wanted. Invisible Inc’s story and setting are the video game analogue to a really good William Gibson short story. The game is set in the late 21st century; where nation states have collapsed and tyrannical corporations have seen fit to fill the power vacuum. The game opens with the headquarters of the titular black-ops organization being raided by the corporations’ enforcers. As “the Operator”, players have to lead Invisible’s two remaining field agents on a series of missions to secure a new base of operations before the company’s AI dies. Though restoring Invisible’s standing among the criminal/hacker/freedom fighting underworld may seem a daunting task, the game, itself, is refreshingly short. I mean on the order of FTL short. Though there are plenty of settings that can stretch the game out, a standard run at Invisible Inc could be finished in the neighbourhood of two to three hours. Make no mistake, this is not a point against the game. Nor should it be seen as an indicator that Invisible Inc lacks substance. As was the case with Don’t Starve, one of Klei Entertainment’s previous games, there is much more to Invisible Inc than the scripted story. The game’s tight timing is, in my estimation at least, a three-fold triumph. First, the time span means I can get invested in a play-through, spectacularly fail at said play-through, and not want to rage quit the game. Second, beginning anew means more variety thanks to the game’s astonishingly robust procedural level generation. Third, every mission is vital when there are only six or seven to a complete game. Time also manifests as a structural motif within the gameplay. Raids against the corporations are measured on an alarm scale. Each turn gradually increases said alarm. The higher the alarm level, the more guards, security mechs, and firewalls appear. This means the old X-Com stand-by gradually exploring a map and letting the bad guys come to the player won’t work. Invisible Inc expects players to be bold in their scouting and swift in their actions. Hacking every corporate safe on a level is a great way to score some much needed operating capital, but it also means contending with more infosec and armed security guards. Mobilizing the language of execu-speak, Invisible Inc is a study in risk/reward decision-making. It’s also deliciously evil of the developers to have money doubling as experience points for the game’s light-RPG elements. This shapes the game such that there will never be enough money to buy everything and level-up all of a character’s stats. Minmaxers and munchkins, the door is on the left. Though Invisible Inc can be downright brutal on its hardest difficulty level, the learning curve is very accessible. The game features a “rewind” system that lets players reset the game to the start of the previous turn. On the starter difficulty level, players can do this multiple times as a means of effectively having a mulligan on a truly botched job. Once again, the choice reiterates a seeming mantra of challenge absent rage quits. In terms of interface, Invisible Inc knocks it out of the park. The control scheme is so intuitive that in about fifteen hours of playing, I’ve never had a mis-click. Likewise, sight lines and cover are easily identified – though both can be turned off if a player truly wants to test their mettle. Rotatable camera angles allow for careful planning while maintaining an isometric point of view that evokes fond memories of Origin’s old Crusader games. It’s also worth mentioning that Invisible Inc does pretty well in terms of building some diversity into the playable characters. Of the ten that can be unlocked, half are women and three are people of colour. While some people might not think this is worth writing home about, I try to pay attention to these things when a developer is making an effort to put more than ubiquitous white dudes in their game. In the final assessment, it’s clear Invisible Inc has a target audience. Nobody should pick up this game expecting to shoot their way through each mission. Everything about Invisible’s style is meant to reward stealth and cunning. In fact, it’s entirely possible to work through the game without killing a single guard or blowing up a security mech. Violence is a player’s last resort, and senseless violence is always punished. Those inclined to use their wits while sticking it to the man will likely find endless hours of fun with this game. At the same time, Invisible’s story will leave any sci-fi geek worth their salt clamoring for more. Overall, Klei Interactive has produced another game with an aesthetic all its own and mechanics that turn the familiar into something new. Buy it, play it, and feel good about yourself when it shows up on various “Game of the Year” lists.